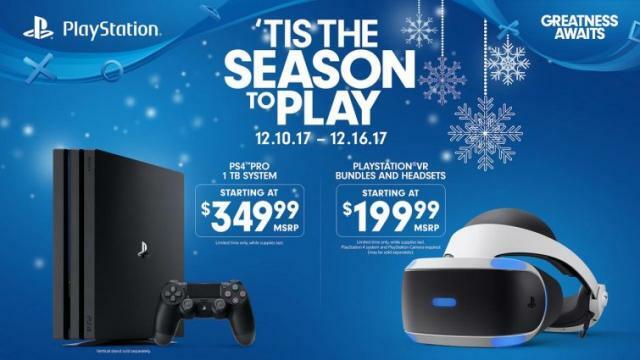 Sony Interactive Entertainment announced it is temporarily dropping the price of the PlayStation 4 Pro and PlayStation VR headset in the US. The PlayStation 4 Pro price will be discounted by $50 to $349.99 from December 10 to 16. The Destiny 2 and Star Wars Battlefront II bundles have been dropped from $449.99 to $399.99. The PlayStation VR Gran Turismo bundle will be discounted by $100 to $199.99 from December 10 to December 24. This bundle includes a PS VR system, a PS Camera, a copy of GT Sport, and the new PS VR demo disc. The world’s first racing experience to be built from the ground up now heightens the experience further by transporting gamers straight into the driver’s seat in virtual reality. Experience thrilling one-on-one racing with select cars in the dedicated VR Drive mode in Arcade Mode. This bundle includes a PS VR headset, a PlayStation Camera, a copy of Doom VFR and the new PS VR demo disc. DOOM VFR brings the fast-paced gameplay fans of the series love to VR. Lay waste to an army of demons as you explore and interact with new areas of the UAC facility on Mars, and Hell itself, from an entirely new perspective. This bundle includes a PS VR system, a PS Camera, two PlayStation Move controllers, a copy of Skyrim VR and the new PS VR demo disc. Skyrim VR is perfect for longtime fans of the game who want to check out Skyrim’s epic world in virtual reality, or for the curious gamer looking to virtually dip their toes in Tamriel for the very first time. The super-charged PS4 Pro system, with a DualShock 4 controller, is available for a limited time at an even greater value. This bundle features a fully customized PS4 Pro system, matching DualShock 4 controller, and a copy of Star Wars Battlefront II: Elite Trooper Deluxe Edition. This bundle includes the Glacier White PS4 Pro with a 1TB HDD, matching DualShock 4 controller, a copy of Destiny 2 and a digital content voucher that includes the game’s Expansion Pass. nice deals for the holidays.